Going to TEDxABQ on Saturday September 17? So are we! Drop by the Quelab booth — outdoors on the Civic Plaza for the “audience engagement” session from 10 am to 1 pm, and indoors during the Speaker Sessions from 1 pm on. Learn more about our makerspace and how you can start making at Quelab! We will have live demonstrations of a 3d printer, a wood lathe and a hand-made bowling lane. (I’m guessing the convention center isn’t going to let us take ALL of our fun toys inside, so arrive early if you’d like to see everything!) 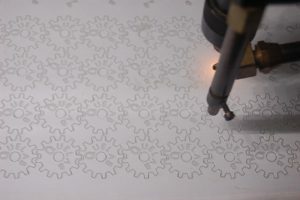 We will also be giving away some laser-cut gears (made on Quelab’s laser cutter — some of the gears are being cut by the laser head in the photo above), which are part of a geared back-scratcher (also a great fidget!) design that you can make yourself with the free design files at http://www.thingiverse.com/thing:1766894. If you don’t have a 3d printer or laser cutter, or would like to learn how to use them, come visit us at Quelab and we can help you! Our open hacknights are every Sunday and Tuesday from 7-10 PM at Quelab, 680 Haines Ave NW, Albuquerque NM, 87102. Tours at 7:30 and 8:30. Special thanks to Kris Hardy with Albuquerque Software for custom laser cutter and 3d printer design, and donating the materials and time for making the gears and backscratchers!